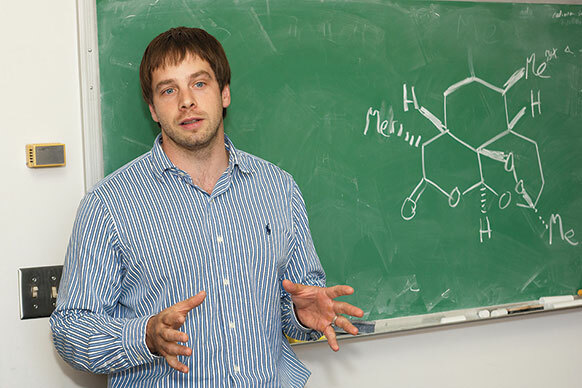 Silas Cook ’99 Finds New Way to Synthesize Antimalarial Drug. Malaria is a killer. Every year, more than one million people, mostly children, die from the disease—the equivalent of a fully loaded 747 crashing into the ocean every 3 hours and 12 minutes, day and night, without end. Another 16 million people are infected each month. As you read this sentence, one in four adults in sub-Saharan Africa cannot work due to malaria infection. The result is $40 billion dollars a year in lost productivity. Malaria’s toll is all the more tragic because there is a highly effective treatment called artemisinin-based combination therapy. The problem is money. At $2.40 per dose, artemisinin is prohibitively expensive in many areas where malaria is endemic. What’s more, supply disruptions often prevent the drug from reaching the people who need it the most. According to the Africa Review, Tanzania is reeling from a shortage of malaria drugs; 26% of that country’s dispensaries have been out of stock for three months. Now a research team led by Indiana University professor Silas Cook may have figured out how to tackle both problems by finding a new way to synthesize the drug. There are two ways to make artemisinin: harvest it from the sweet wormwood plant (Artemisia annua) or synthesize it in the lab. 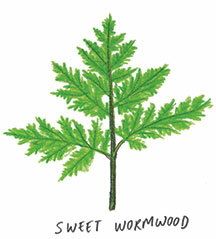 Harvesting it from wormwood is difficult to begin with; each plant contains only a tiny proportion of artemisinin—between 0.001% and 0.8%.Combined with crop shortages caused by poor planning, natural disasters, and other unpredictable disruptions, this method has proven incapable of providing a consistent, cheap yield. Lab synthesis of artemisinin has always shown more promise. But, although chemists have developed several different methods to synthesize the drug over the last 30 years, they were all too long, too complicated, and too expensive to compete with natural production. Most researchers working on malaria came to believe that there would never be a viable synthesis of artemisinin, focusing instead on developing stronger and higher-yielding strains of sweet wormwood. Silas knew that the research suggested that synthesis was not viable, but he was undeterred nonetheless. He has been thinking outside of the box ever since his time at Reed, where he was just as fascinated by reading philosophy with C.D.C. 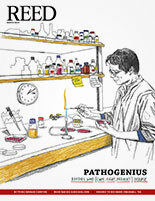 Reeve [philosophy 1976–2001] as with taking organic chemistry with Pat McDougal [chemistry 1990–]. His major, an interdisciplinary combination of biochemistry and molecular biology, allowed him to keep his focus broad in his junior and senior years. Using this framework, Silas and his team treated the synthesis like a puzzle, where the key piece was finding a cheap, readily available ingredient that could serve as a starting point. The traditional approach to building artemisinin relies on the use of protecting groups, a sort of molecular camouflage that shields the evolving compound from nasty reagents during synthesis. Unfortunately, this is complicated and adds a lot of steps to the procedure. So, Silas and his group sidestepped this technique and turned instead to an innovative approach involving cascade reactions, in which different parts of a single molecule react with each other. The big payoff was that this allowed them to start the synthesis with cyclohexanone, a nonpolar solvent that is commonly used in labwork to dissolve greasy molecules from water. While kilograms of wormwood yield only minimal amounts of artemisinin, cyclohexanone will yield the compound on a gram scale. Best of all, cyclohexanone is a key ingredient in the manufacture of nylon, which means that chemical giants like BASF produce millions of tons of it per year. You can buy it on the internet for $2 a kilogram. Using cyclohexanone as their foundation, Silas and his team developed a streamlined, five-pot synthesis, which they described last year in an article in the Journal of the American Chemical Society. Their procedure is cheap, is simple, and, most importantly, can be implemented on a mass scale. None of this might have happened if Reed had not had a website in 1993. When he was a freshman in high school in rural Wisconsin, Silas took the ACT exam (the college test standard in the Midwest). He meant it as practice, but he scored exceptionally well—so well that Reed sent him a postcard suggesting that he learn more about the school. His interest piqued, Silas checked out Reed’s web page—a relative novelty in an era when only a handful of colleges had presence on the internet. His high school was famous for its wrestlers, not for its academics, so when he graduated early, his counselor’s advice was limited; few of his classmates set their sights beyond the University of Wisconsin in Madison. Luckily Silas already knew where he wanted to go, thanks to Reed’s web presence. “A Concise Synthesis of (+)-Artemisinin.” Chunyin Zhu and Silas P. Cook. Journal of the American Chemical Society. 2012, 134(33), 13577-13579.